While we like to think we’re tight with the royals (like, we’re not technically invited to Prince Harry and Meghan Markle’s wedding on May 19th, but that is surely an oversight), there are protocols in place that even we don’t know about. And a lot of them involve when the royal family can touch both other people and each other. So people are of course freaking out over the fact that William was spotted showing some brief affection to wife Kate Middleton on St. Patrick’s Day. While PDA between the pair certainly isn’t forbidden, it’s definitely rare. While standing next to one of the royal guards, William slipped his hand on Kate’s back in a quick show of love and support. And while this might not seem like a big deal, the act is somewhat daring considering that they’re both representatives of the British monarchy. Back in 2016, People.com spoke with Myka Meier, a royal etiquette expert who explained why PDA is rare among the royals. "There is no actual etiquette or royal protocol that says the couple must refrain from PDA," she said. "The likely reasoning is more that while traveling...technically the couple are working representatives of British Monarchy. The couple are likely to show very little PDA, if any, to remain professional during their designated roles abroad." 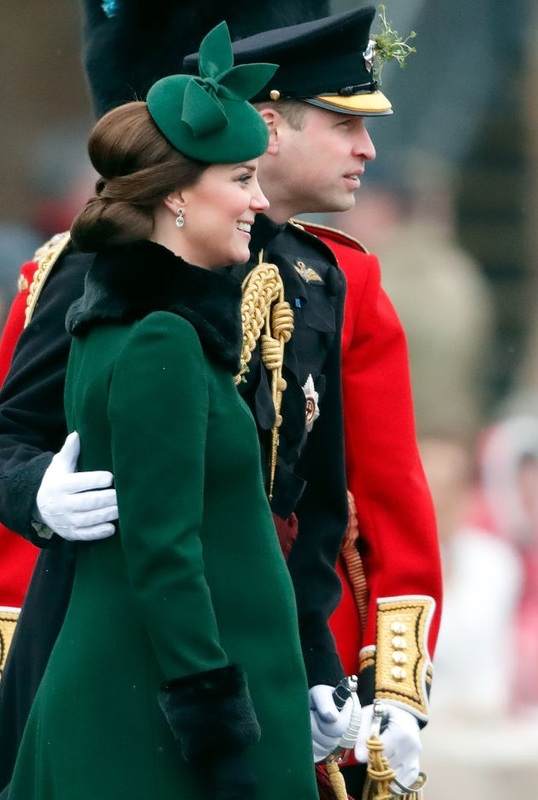 So seeing William touch Kate in this particular way at the annual Irish Guards St. Patrick’s Day Parade at Cavalry Barracks on March 17th stood out. But in a good way. GoodHousekeeping.com reported that it’s not as rare to see Prince Harry and Meghan Markle holding hands because they hold different roles in the family. Since William and Kate hold the titles of Duke and Duchess of Cambridge, it’s more common to see them keep a “professional” distance. The above moment seemed relaxed and candid, and we’re HERE FOR IT. Feel free to hug it out any time, guys — we promise we won’t mind.